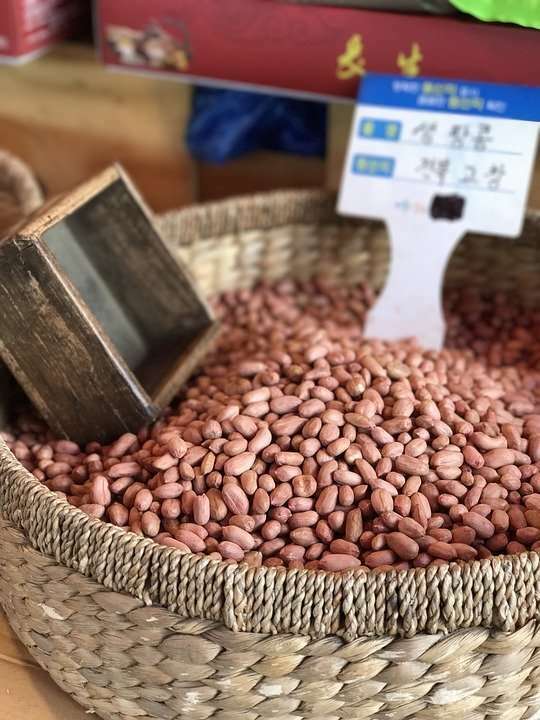 Peanut oil is a vegetable oil, which is mostly used for cooking, but by virtue of its qualities, it falls into the category of natural oils for hair care. It’s aka groundnut oil or arachis oil. Back home, it’s one of the primary oils we use for frying plantains, chicken, beef, fish and pastries. Peanut oil is also a staple in American and Asian cooking. Peanut oil is derived from peanuts/groundnuts and is available in different varieties such as refined, unrefined, cold pressed, and roasted. Refined peanut oil has been refined, bleached and deodorized. This process eliminates the component of the oil that causes allergic reactions. Vitamin E oil is added as a preservative to refined oil to elongate its shelf life. Roasted peanut oil is specialty oil similar to sesame oil. The peanuts are roasted before being pressed for oil to enhance the flavor and aroma of the oil. It’s one of the best types for cooking. Unrefined peanut oil has been processed mildly to retain as much of its natural qualities as possible. The aroma in this type is softer than roasted peanut oil but it’s the most natural end product. Unrefined peanut oil has a high vitamin E content. There are some peanut oil blends that have other kinds of oils mixed into it especially soybean oil. This is done to reduce the cost of the oil but the taste isn’t the same. Peanut oil contains oleic acid, linoleic acid, and palmitic acid. 100g of peanut oil contains saturated fat, 48.3 g of monounsaturated fat, and 33.4 g of polyunsaturated fat. Unrefined peanut oil has a smoke point of 320 °F while refined peanut oil has a smoke point of 450 °F. Unrefined peanut oil contains high amounts of vitamin E, which extends its shelf life, provides antioxidant properties and softens hair. 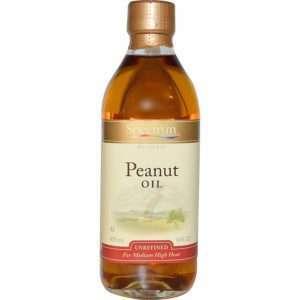 Peanut oil contains an emollient component which creates a barrier on application. This barrier can help reduce the loss of protein from hair during shampooing. Another oil that can help achieve this is coconut oil. You can read more at Luscious, Lustrous Hair with Coconut Oil. 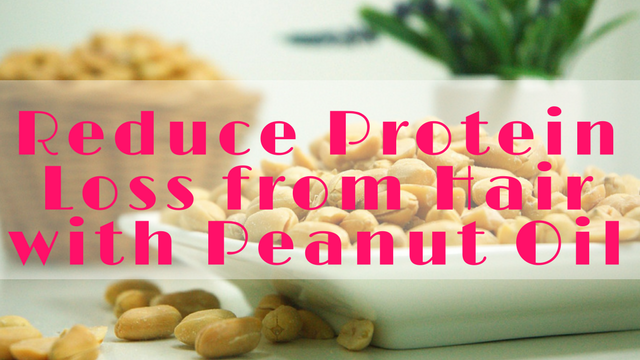 Anti-inflammatory properties in peanut oil help control flaky scalp and dandruff issues. One of peanut oil’s best qualities can be noted in its high smoke point, which makes it suitable for straightening or blow-drying hair. You can read up more information about straightening hair with oils here – Is It Safe to Use Heat Styling Devices with Oils? 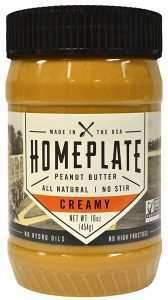 You can also receive the benefits of peanut oil via natural peanut butter which is healthy, all natural and can be added as a topping for many dishes. Heat up about 4 – 5 tablespoons of peanut oil in the microwave. Shampoo your hair then apply the peanut oil to your scalp in sections. 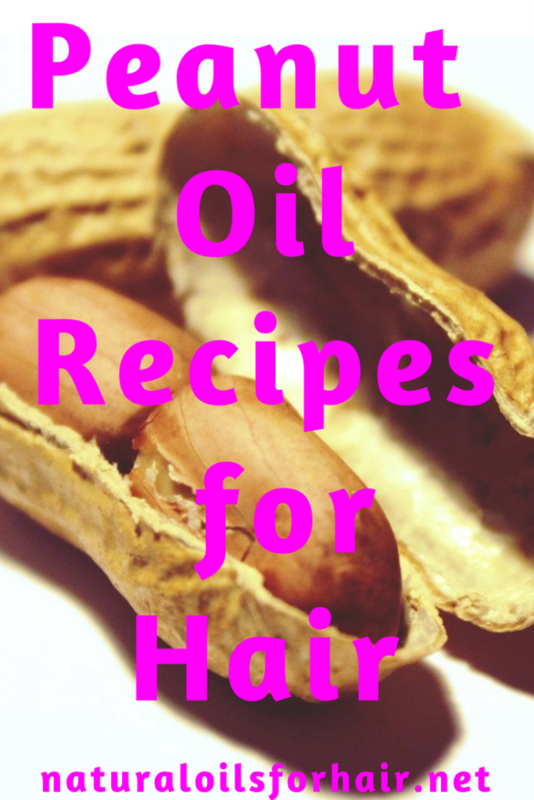 Once your scalp is covered, apply the rest of the peanut oil to the length of your strands. Get a good scalp massage in there, cover with a disposable cap and leave in for 45 – 60 minutes. Wash out with a deep conditioner, then rinse with warm water. Do a final rinse with a blast of cold water to close the cuticles. Mix 4 tablespoons of peanut oil with 5 – 10 drops of peppermint essential oil or tea tree essential oil. Add 5 – 10 drops of lemon juice. Apply to your scalp, massage in, cover your head with a disposable cap then leave in for 2 – 3 hours. Remember, lemon juice can lighten hair so restrict the application to your scalp. The treatments above can be done once a week alternating between the two depending on your hair issues. You can also include it in your oil rotation for its benefits by adding a bit to your deep conditioning recipe from time to time. Though refined peanut oil has been processed to remove the allergens, it’s still a good idea to remain cautious if you’re allergic to nuts. Do a patch test a few weeks before using peanut oil on your hair. 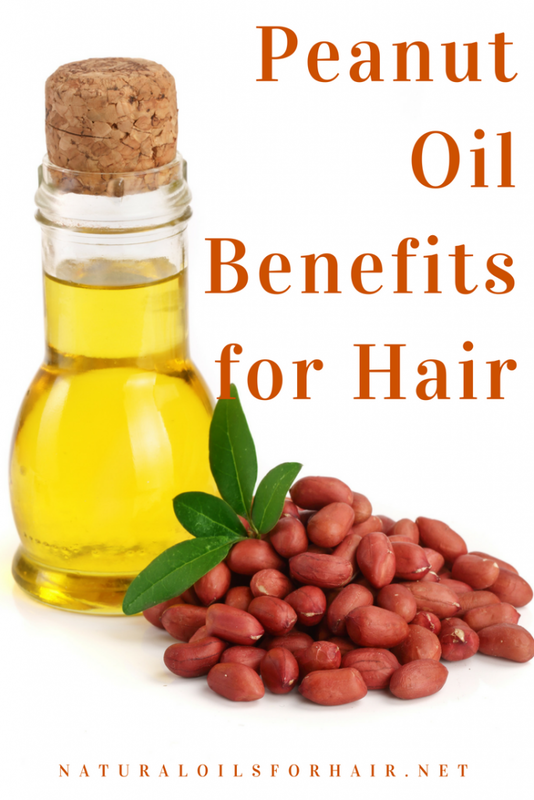 If you have enjoyed this article and want to know more about how you can use natural oils for common hair issues and overcome them, have a look at How to Grow Hair Healthy & Long with Natural Oils. There’s an entire section in there dedicated to natural oils for dandruff. Good article but instead of microwaving my oil, I fill up the sink with hot water and let the oil warm in a bowl. This allows me to control the temperature more effectively. Thanks for visiting Tabitha :). That is an excellent way to also heat up the oil. The microwave is for people who are in a bit of a hurry.